When I first began to learn how to quilt, I bought several books to teach myself ideas, techniques, and some basics about design and color. My first year I made some of the quilts shown in the books to practice skills. I always came to the end of the quilt “how to” directions and encountered the oft repeated phrase “Quilt as Desired”. YIKES! What does that mean?! So, then I bought some books on machine quilting. And I spent hours with Leah Day’s website with over 400 different free motion designs. I made samplers with different designs which hang on my studio wall for inspiration. 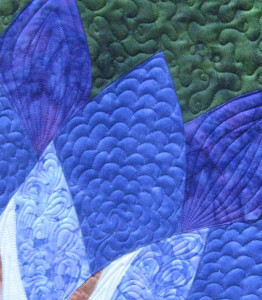 And yet….I often look at a new art quilt and again ponder how to quilt it. I’m going to do a series of blog posts to start off 2016 about how I make these decisions, sharing examples. Deciding “how to quilt a quilt” is as important as the design and piecing of the art quilt. I think quilt stitching for art quilts is a further challenge because the spaces we are quilting are not square. Often designs for free motion quilting are shown in a neat square which is the basis for traditional quilts. My contemporary art quilts have more open spaces, or pieced backgrounds, basically anything BUT a square patch upon which to design quilt stitching. 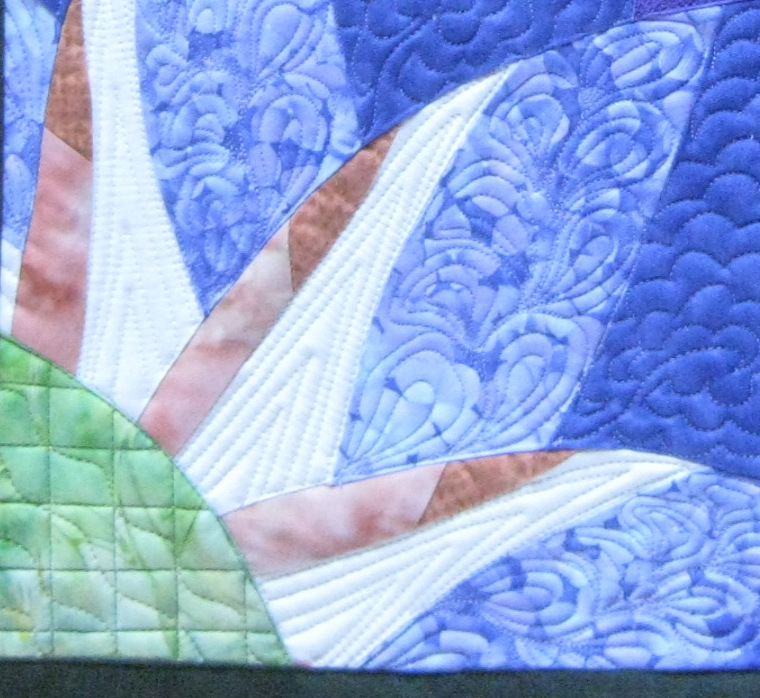 My overall goal with the quilt stitching is to enhance the design, not just secure the quilt top to the backing. 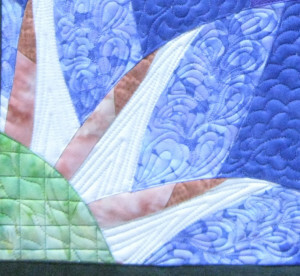 Often I see a stitch design I like but then I must modify it a bit to work in a quilt. Free motion stitches are limited only by our imagination. Equally important to the stitch design is the thread color. I chose blending threads for all parts of this quilt except the medium purple (scallops) where I wanted the stitching to be more visible, again to give texture and depth to the quilt. I change thread colors frequently on most quilts if it enhances the design.